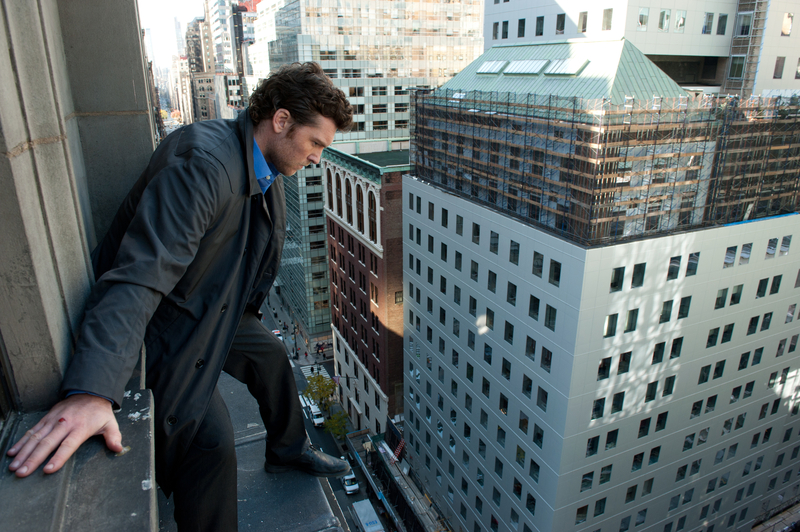 Viewers who demand strict realism from their movies will have big problems with “Man on a Ledge,” an intense thriller about a person pushed to the breaking point. Sam Worthington plays Nick Cassidy, a former cop convicted of a diamond theft that he swears he didn’t perpetrate. After an unlikely escape from prison, he makes his way to a lofty, Manhattan hotel, climbs out a window and threatens to throw himself to the street below. At first, police don’t know who Nick is, so they respond as they would to any potential jumper. That means standard rescue personnel and a negotiator. These folks soon discover, however, that Nick is hiding something. His hotel room doesn’t contain any identifying information, and he rejects the first negotiator (Edward Burns), demanding to talk only with Lydia Mercer (Elizabeth Banks), a woman scarred because the last jumper she dealt with plunged off the Brooklyn Bridge. As police try to determine Nick’s identity and talk him down from the ledge, viewers learn there’s a lot more going on than a suicide attempt. In fact, a fair amount of screen time is given to Nick’s brother (Jamie Bell) and his brother’s girlfriend (Genesis Rodriguez), both of whom embark on dangerous exploits of their own. The entire cast is solid, but it’s Worthington who carries the day. His performance is crucial because the movie hinges on viewers liking Nick and investing in his dilemma. Having a lead actor that viewers identify with is also important because much of what happens – particularly toward the end of the movie – is completely implausible. Still, “Man on a Ledge” is fun. Viewers willing to suspend disbelief and follow screenwriter Pablo F. Fenjves and director Asger Leth, will be rewarded with a fast-paced story that is just as inventive as it is ridiculous. DVD and Blu-ray extras include a making-of featurette and a trailer with audio commentary by Banks. In “Gone,” Amanda Seyfried plays Jill Conway, a Portland, Oregon, woman haunted by memories of an abduction that nearly claimed her life. Although Jill is obsessed by the trauma, police weren’t able to corroborate her story, so they are convinced she is delusional. This becomes particularly disconcerting when Jill’s sister, Molly (Emily Wickersham), goes missing. Despite limited evidence, Jill is convinced that her former attacker is holding Molly captive. Since the police are unwilling to help, Jill desperately searches for clues that can help her locate her sister… even if that means another encounter with her abductor. The key to most thrillers is pacing, and director Heitor Dhalia, keeps “Gone” racing along. That allows viewers to hang on the edge of their seats as Jill slowly unravels the mystery of her sister’s disappearance. Perhaps the greatest feat Dhalia achieved is leaving Jill’s mental stability open to interpretation. In other words, savvy viewers are given reason to believe the police may be right. Seyfried is a hot, young talent, and in “Gone” she does a reasonably good job playing a seriously distressed woman. Although the film sits almost entirely on Seyfried’s shoulders, the supporting cast is respectable, doing what it must to move the action forward. The biggest problem with “Gone” comes at the climax. After the respectable setup, viewers can’t help but hope for something astounding. Rather, they are treated to a series of increasingly silly events in which key characters throw all logic aside. The DVD and Blu-ray releases don’t have any substantial extras. Based on Lionel Shriver’s award-winning novel, “We Need to Talk About Kevin” is a disturbing examination of both the human psyche and the bonds between parent and child. Co-writer and director Lynne Ramsay delivers the plot in non-linear fashion, focusing on Eva Khatchadourian (Tilda Swinton), mother of a teenager who is imprisoned after orchestrating a massacre at his high school (Ezra Miller). The movie alternates between past and present, with Eva doing her best to come to terms with Kevin’s crime and accept that society – unable to separate her from her child – sees her as a pariah. The always-reliable Swinton is outstanding, and her work earned her a Golden Globe nomination for best performance by an actress in a motion picture drama. Swinton is not, however, the only one deserving of performance accolades. Miller is also fantastic, and his performance as Kevin avoids kitsch while delivering a pitch-perfect mix of creepy and believable. Also, John C. Reilly is solid in an important supporting role. “We Need to Talk About Kevin” is interesting in that it asks viewers to consider both society’s view of the parents of sociopaths and a parent’s responsibility in spotting potentially violent behavior. In the movie, Eva receives frequent hints that Kevin isn’t a normal child, yet her husband (Reilly) dismisses the concerns. Then, after the boy has snapped, she’s left to pick up the pieces in a society unwilling to accept her. Because the movie regularly shifts between flashback and present tense, it can be a chore to keep up with the narrative. The subject matter also assures that the movie is as frightening as it is thought-provoking. That is not, however, a negative. Some films are meant to entertain. Others, like “We Need to Talk About Kevin,” are meant to change our perceptions of the world. DVD and Blu-ray extras include several making-of features and an interview with Shriver. “Coriolanus”: Ralph Fiennes makes his directorial debut with this modern-day adaptation of the William Shakespeare tragedy. Along with directing, Fiennes plays the title character, a Roman general who attempts revenge on his own city after being banished. Gerard Butler, Brian Cox, Jessica Chastain and Vanessa Redgrave also star. Ingmar Bergman classics: The Criterion collection is rolling out new digital restorations of two of the Swedish director’s films from the 1950s: “Summer Interlude” and “Summer With Monika.” “Summer Interlude” focuses on a veteran ballerina (Maj-Britt Nilsson) haunted by a tragic affair. “Summer With Monika” is a love story about working-class teens (Harriet Andersson and Lars Ekborg) who run away together. “True Blood” – The Complete Fourth Season: Twelve most recent episodes of HBO’s hit drama based on writer Charlaine Harris’ Sookie Stackhouse vampire novels. “Maverick” – The Complete First Season: First 27 episodes of 1950s and ’60s TV dramedy about Old West card sharks. James Garner and Jack Kelly star. “Rookie Blue” – The Complete Second Season: ABC just debuted the third season of this drama about police officers negotiating through their first year of service. Missy Peregrym, Gregory Smith, Travis Milne, Enuka Okuma and Charlotte Sullivan star. “Memorial Day”: War film in which a young man (Jonathan Bennett) discovers that his experiences as a soldier in Iraq have many parallels to those that his grandfather (James Cromwell) faced in World War II. “Love Never Dies”: Taping of a live production of Andrew Lloyd Webber’s sequel to “The Phantom of the Opera.” In this musical, the Phantom makes one final attempt to woo his love, Christine Daae. Ben Lewis, Anna O’Byrne, Maria Mercedes, Simon Gleeson and Sharon Millerchip star. “Goon”: Sports comedy about a bouncer (Seann William Scott) who becomes a minor league hockey star. Jay Baruchel, Alison Pill, Liev Schreiber and Eugene Levy also star. “The Jungle Bunch”: Animated movie about a penguin who was raised in the jungle, believing himself to be a tiger. — Forrest Hartman is an independent film critic whose byline has appeared in some of the nation’s largest publications. E-mail him at forrest@forresthartman.com.